Season 2 of Elementary saw the modern-day Sherlock Holmes (Johnny Lee Miller) continuing to consult for the New York Police Department, with Joan Watson (Lucy Liu) as his junior partner who he is training in being a detective. This season has them returning to London for one case and running into Holmes’ brother Mycroft (Rhys Ifans) who becomes a recurring character throughout the season. The mysteries are solid, although they tend to take a fairly predictable turn of Holmes getting one or two incorrect solutions before arriving at the truth. The mysteries have a strong tendency towards intrigue and deep conspiracies as plot elements. Probably the highlight of the season was their take on Inspector Lestrade (Sean Pertwee). In this story, Holmes’ assistance of Lestrade led to national notoriety. However, when that assistance ended due to Holmes’ drug use, Lestrade ended up on the downswing unable to cope with the unreasonable expectations set. It’s interesting exploration and Lestrade is a fun character with a nice little arc. The series struggles on several fronts though. Of all modern Holmes adaptations, Elementary’s First Season featured the strongest supporting cast in Captain Gregson (Aiden Quinn) and Detective Marcus Bell (Jon Michael Hill.) It really felt like we saw less of them, particularly Captain Gregson. Bell had a mini-arc in the season where Holmes’ arrogance caused an injury which nearly ended Bell’s career. This arc was interesting, although the resolution wasn’t particularly satisfying. The biggest problem is the relationship dynamic between Holmes and Watson. In the traditional Holmes and Watson relationship, Holmes is exceedingly brilliant compared to Watson. Watson’s no fool, but he lacks the pure brilliance of Holmes. What Watson typically contributes is determination, physical courage, and a better understanding of how human beings work. He also has a great awe for his friend’s power. This is where the decision to gender-swap the role of Watson becomes problematic. To have a woman as in awe of Holmes, and to have Holmes as superior to a woman partner, would be seen in today’s era as sexist.So the writers made Joan Watson a novice detective to become almost Holmes’ equal in deductive ability by the end of the season. The problem with this approach is, for the Holmes/Watson dynamic to work, Holmes must be head and shoulder above all his compatriots, considering how hard he can be to work with. With difficult detectives of any gender, if they are just slightly above average compared to other detectives, why put up with the headaches of working with them? To be honest, Holmes is often insufferable throughout this second season. He remains manipulative and self-absorbed. He harasses the family of a friend who died of a drug overdose after decades of sobriety and raises the possibility of foul play because he’s afraid of eventually relapsing himself. He’s rude with a lot of people who clearly didn’t deserve such mistreatment. (Editor’s note: no one deserves mistreated.) His story line this season is one of trying to keep Watson close, because he needs her for his well being and equilibrium. What the season seems to show is she has no need for him. She is a strong, independent woman who makes her own choices, is her own person, and has no need for anyone. She needs the work but is perfectly capable of doing it without him by the season’s end. The original Holmes and Watson dynamic was interdependent. They needed each other, and that’s the key to any dynamic joint detective program. Failing to capture this hurts the series. Not helping it was a story arc woven through the season that seemed more Soap Opera than Sherlock Holmes where Watson had a relationship with Holmes’ brother because they could. The plot twists and turns were outrageous and seemed to be trying to compete with the bizarre and wild plot turns on the BBC Series Sherlock. While I’ve criticized many things about Sherlock, the series has an undeniable sense of style that allows it to pull of most of its wild plot turns. Elementary lacks that and so many of these plot ideas fall flat. The series isn’t bad, particularly when it comes to its mysteries. Yet, Season 2’s fundamental problems with characters and characterization make it okay at best. The Fibber McGee and Molly Double feature presents Jim and Marion Jordan reprising their roles as the most lovable citizens of Wistful Vista in two separate films. The first is, Here We Go Again. As the title implies, it’s a bit of a sequel. In this case, the film’s teaming of Edgar Bergen and his ventriloquist dummy Charlie McCarthy with Fibber McGee and Molly is their second joint movie. The first, “Look Who’s Laughing,” was released on a separate DVD collection of early Lucille Ball films. But there’s no sense of deep continuity other than that Fibber McGee has met Bergen before, so seeing that film isn’t a prerequisite. The teaming works quite well when they interact, though they’re often left to do their own thing. The plot is that Fibber McGee takes Molly on a Second Honeymoon and after staying a night a flea bag hotel, he runs into Charlie McCarthy and Edgar Bergen at a much nicer establishment. Bergen is trying to discover a synthetic alternative gasoline and a capture a rare butterfly because…it’s World War II and that’s what radio ventriloquists did. As if the film hadn’t given Old Time Radio fans enough to salivate over, this also features Harold Peary appearing as the Throckmorton Gildersleeve. Even though he’d started his own spin-off series from Fibber McGee and Molly, The Great Gildersleeve, Peary plays Gildersleeve just as he did on Fibber McGee and Molly and only appears in a few scenes. Gale Gordon also appears, though not in his role from Fibber McGee and Molly as Mayor LaTrivia but as what passes for a villain in this film. The movie holds up very well for its era. For the most part, the jokes work. The big exception to this is an unfunny, ill-conceived bit that had Bergen trying to infiltrate a native american tribe for the flimsiest of reasons. The musical numbers by Ginny Simms are superb. For fans of the golden age of radio, the movie allows us to see not one but three different big radio stars in action. In addition to Charlie McCarthy, we also get to see Bergen’s other dummy Mortimer Snerd. Though McCarthy receives the most work and it’s interesting to see how they transferred such an active and robust ventriloquist dummy from radio to film. Though, I will say that Charlie McCarthy has a few moments (such as when he’s cheering the potential death of Bergen from various perils) that remind you why we now consider ventriloquist dummies walking around to be a creepy element of horror movies. The second film is Heavenly Days derives it’s name from Molly’s frequent exclamation, “Oh heavenly days!” In this film, Fibber is visited by the Spirit of 1776 to begin a cross-country journey to the nation’s Capital in order to help out a friend who has become a “dollar a year” man, essentially volunteering his service to the government. Fibber heads to Washington, hoping that the voice of the common man is heard. The film starts out okay and for the first fifteen minutes is very charming, including the McGees encountering a group of soldiers on a train and singing and we even get to hear Fibber sing. However, after that, the film runs into problems. It’s a comedy that isn’t all that funny. It’s also a patriotic film. I’m all for patriotic films, but this one muddles its message. McGee’s whole quest is to get the voice of the average man heard in the corridors of power. He gets to Washington and actually disrupts Senate proceedings to give his own nonsensical speech. Then later, he has a trippy dream sequence where senators advise him if the Average Man wants to have a voice in government, he should probably get informed and make sure he knows what he’s talking about. The plot, the message, and the ending feel incongruous. The film’s core problem may be that it expected too much of the Jordans. During, their radio program, they did many war-related episodes and while they could be preachy, they always remained entertaining. The reason was because they were focused on a single point (such as a scrap metal drive) and they had the entertaining cast of characters in Wistful Vista to help get the laughs. Here, the Jordans are left to get all the laughs and carry this meandering story. The film does have its redeeming values. The presence of Fibber McGee and Molly on screen is a treat and they have charming moments including both of their musical numbers. The film features war orphans from several lands which is a historical reminder of a great tragedy in that war. 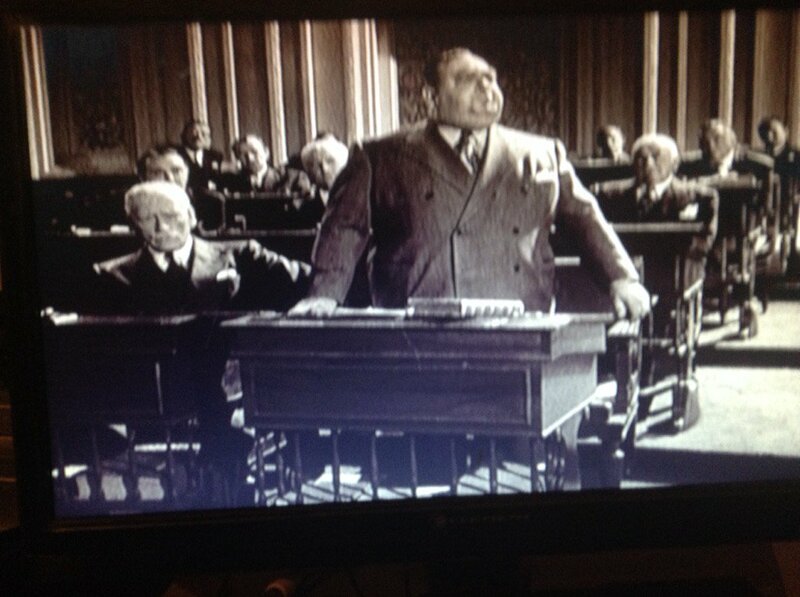 For movie buffs, it features an interesting oddity that relates to Mr. Smith Goes to Washington. In that film, hefty character actor Eugene Pallette plays Chick McGann, a henchman for political boss James Taylor whose job is to help keep Senator Smith under control. In this film he played a Senator which led me to think McGann got one of the vacant Senate seats that were left open at the end of the movie. Even though\ Heavenly Days is a well-intentioned mess, I still consider the DVD a good buy because Here We Go Again is just that good. It’s rare to see that many radio stars in that same film and for the film to actually be good. The current price is a fair value for the first film and and any enjoyment you get out of the second film is just gravy. Released in 1969, the Campus Murders by Ellery Queen introduced Micah McCall. The premise is an intriguing one. McCall is a Special Assistant to the Governor of an unnamed state who is called in to act as a troubleshooter. In this case, he’s looking into the disappearance of the daughter of one of the Governor’s intra-party political rivals on a small campus, troubled by unrest. His status is a nice feature. He’s not a policeman, but his standing as “the Governor’s Man,” gets grudging cooperation from the police. McCall finds himself not particularly trusted by the police and being over thirty, he is not welcomed and not fully trusted by most of the radical college students attending the college. On the positive side, the mystery isn’t bad, and if you want a taste of the 1960s and how the problems on campus were viewed, this book certainly gives a perspective and captures the spirit of the time. There’s nothing more 1960s in the book than Nature’s Children, a group of college students who demonstrate while wearing grotesque masks in the buff and haze McCall. On the negative side, the book drags at times, particularly before the first murder in the book. It is so focused on the campus issues and getting all these various student perspectives that it really has troubling remembering that it’s a mystery. And when it comes to the big issues of the day, it offers a simple pat solution that minimizes the complexity of the issues it’s addressing. McCall’s characterization doesn’t age well, particularly when it comes to women, but even by the standards of the time, it’s hard to see his behavior as anything but boorish and shallow. Otherwise, it’s not horrendous but neither is it compelling. It’s a fairly competent book, but it left me completely uninterested in further installments in the series.